WASHINGTON (CNN) -- Video showing Pfc. Bowe Bergdahl, captured by the Taliban in Afghanistan, is just another example of how captors use the medium for psychological warfare. U.S. Army Spc. 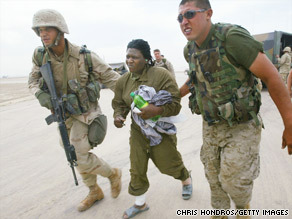 Shoshana Johnson, who was held by insurgents in Iraq, prepares to enter a plane to safety. The latest video shows Bergdahl, of Ketchum, Idaho, looking comfortable and eating food. While he expresses concern about not seeing his family and girlfriend again, he does appear to speak calmly and has no visible signs of abuse. "I have a very, very good family that I love back home in America, and I miss them every day that I'm gone," he says in a 28-minute video released by his captors. "I miss them, and I'm afraid I might never see them again and that I'll never be able to tell them I love them again. I'll never be able to hug them." But that is in stark contrast to the well-publicized captures of U.S. servicemen and women in conflicts past. Sen. John McCain, whose plane was shot down during a combat mission over Vietnam in 1967, is considered one of the most famous prisoners of war. He was captured by the Communist Viet Cong and spent nearly six years in a prisoner of war camp, where he was often tortured. A grainy black-and-white film released by his captors showed a severely injured McCain talking on camera in the so-called "Hanoi Hilton." Is Taliban using video to try to change its image? McCain later refused to be released before other prisoners. He eventually returned to the United States in 1973. "During the years, we were kept in solitary confinement or two or three to a cell because they didn't want us to see each other. We'd spend all our time tapping on the walls to each other and encouraging each other and organizing, organizing, organizing with our chain of command. The days and hours go by," McCain told CNN's John King last year. And most recently, in 2003, video from Iraq painted a picture of an unruly and chaotic terror organization holding U.S. soldiers captured in the Iraq military theater. Army Spc. Shoshana Johnson was shown on videotape being interrogated -- with five other soldiers including Pfc. Jessica Lynch, who was badly wounded and was held prisoner at a separate location. Nine of their fellow soldiers were killed when their convoy was ambushed. Johnson appeared frightened, with her eyes darting quickly left and right. "I was terrified. I didn't know what was going to happen to me," Johnson said in a past CNN interview. "And I was in a lot of pain." Lynch's videotaped rescue made her a celebrity, and she was used by the Pentagon to put a face on the men and women who were fighting the war against the regime of Saddam Hussein. Johnson and the other POWs spent 22 days as prisoners until Marines rescued them. Chris Voss, a former lead international kidnapping coordinator for the FBI, says that as a lesson from the Johnson video, the Taliban may have learned to try to appear more political than radical. "They're hoping that ... this gets to other media outlets that will make them appear so that they are a reasonable political force," he says. "There is very much a lack of overthreat in the [Bergdahl] video, and they clearly thought this through ... specifically strategic for these purposes." Army Chief Warrant Officer 3 Michael Durant, a Black Hawk helicopter pilot, was shot down in 1993 during a combat mission in Mogadishu, Somalia. The body of one of his fellow pilots being dragged through the streets was captured on video. After the crash, he was captured by a mob and held for 11 days. Durant suffered several serious injuries, including a broken back and face and leg wounds. He was later released. His bloodied and bruised face was splashed on the covers of several national magazines, including Time and Newsweek, and on TV networks. His story later inspired Mark Bowden's bestseller "Black Hawk Down" and a movie by director Ridley Scott. Voss says his image was depicted in a different way than others had been. "The media picked that up and ran in a way that was very accusatory towards the United States," he says. "There were pictures of Mike Durant in a clearly beaten-up condition, and the captions in the various national magazines were, 'What in the world are we doing?' "
Voss says that from that incident, the United States may have learned to apply the mostly mum stance it's using during the Bergdahl capture. "The U.S. government gave a knee-jerk reaction to that, which I think they've learned from," he says. "So how this plays out in the media, the Taliban is being very cautious to appear to be reasonable ... because they don't want to make themselves look like they're fanatical. They are trying to be very reasonable."